The weather has been gorgeous in Belgium for the last week or so, and which gave us a hankerin for some pulled pork! I guess the Spring/Summertime weather made us nostalgic for outdoor cooking. Since my smoker is stored away back in the US and I don't have a grill, I have to make my pulled pork in the oven. 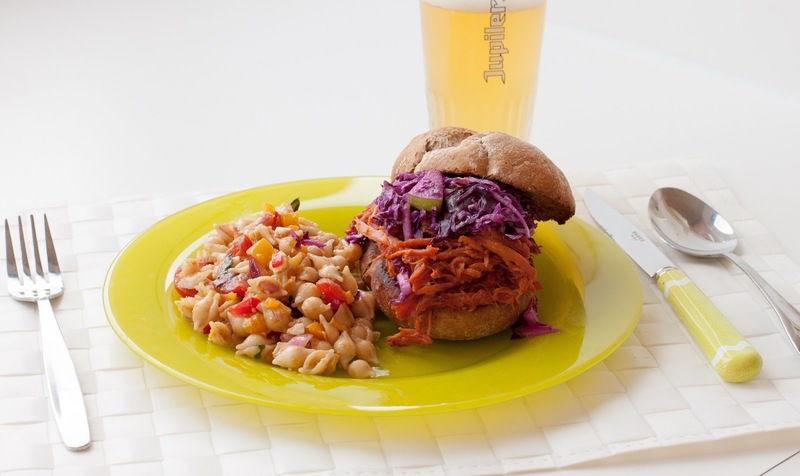 Not to worry though, your guests will go bonkers over this and you won't miss your grill (except for a tiny bit). The process is simple: brown your meats, add in the veggies and sauce, and then cook in a low oven until it's fork-tender. Then you'll use the braising sauce as your BBQ sauce, which will be packed with flavor. 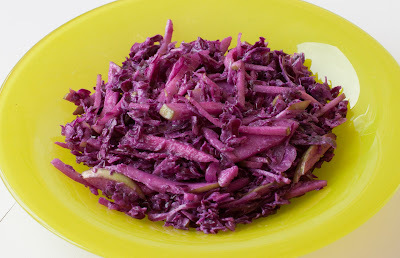 As per Katy's suggestion, we made a light and tangy red cabbage and green apple slaw to go on top of the sandwiches. I added bacon to the recipe to add a smokey flavor to mimic some of the great flavor you would get from the grill/smoker. First, slice the bacon into matchsticks and brown it slowly over low heat. This should take about 15 mins. While this is going, you can prepare your veggies. The shape of the cuts for the bacon and veggies doesn't really matter - you'll be blending them all into a sauce later. Remove the bacon from the pan, increase the heat to medium, add the pork shoulder and brown on all sides. Add the onions, peppers, cumin powder, and garlic. Wait 3 mins, then add the liquids. Don't add salt until the end - the bacon will add most of the salt by itself. Place everything into the oven in a covered pot (or in a baking dish covered in tin foil). The oven should be at around 275F. Cook until the shoulder until the meat easily shreds with a fork. This should take around 5 hours depending on the size of your pork shoulder. Refer to the recipe here if you need more details. 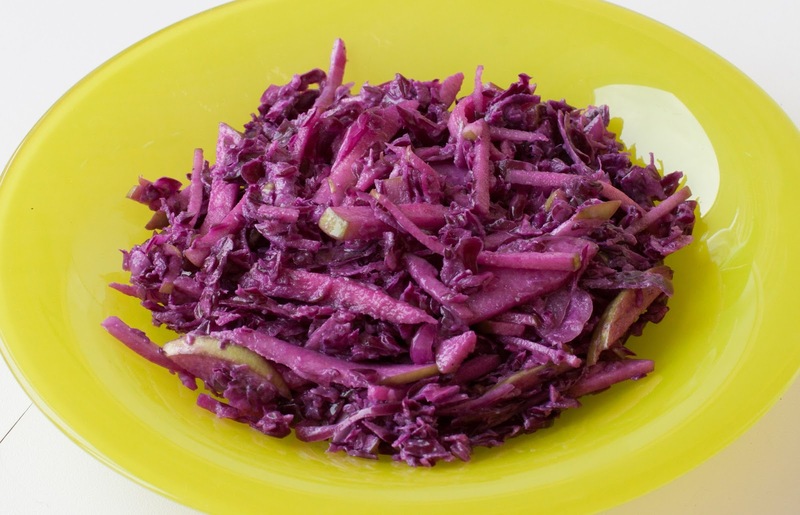 Here is a quick run-down: shred your cabbage with a cheese grater on the large holes, slice your green apples and red onions, and combine it all into a bowl. Make up the dressing by mixing the mayonnaise, apple cider vinegar, honey, and soy sauce together. 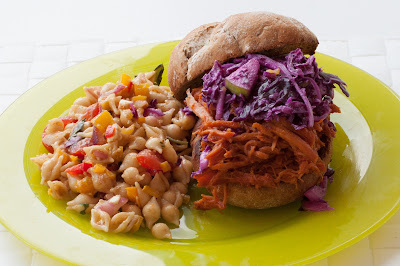 Mix in the dressing and let the flavors combine until you are ready to serve your pork. Remove the shoulder and puree the veggies and sauce that are left over. This will be your BBQ sauce for the pulled pork. If the sauce looks a bit too runny, reduce it over low heat. 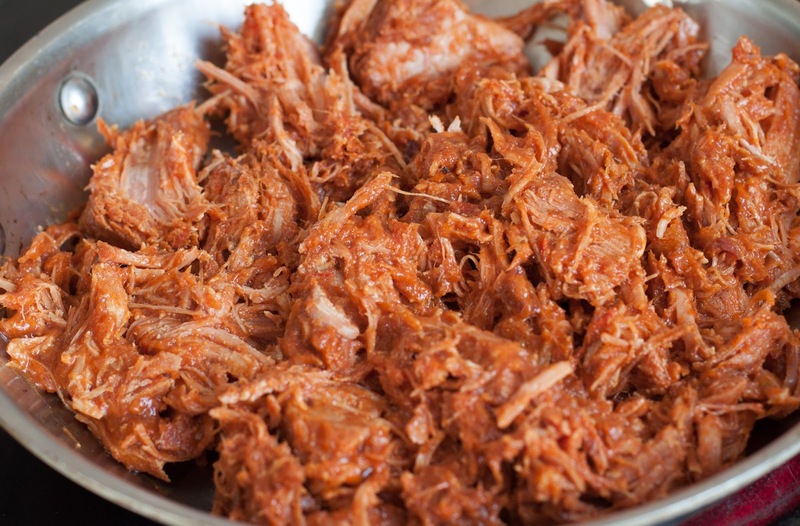 Pull the pork with your fingers or a couple of forks and combine it back with the BBQ sauce.